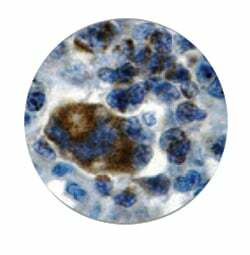 Bax is a mouse monoclonal antibody derived from cell culture supernatant that is concentrated, dialyzed, filter sterilized and diluted in buffer pH 7.5, containing BSA and sodium azide as a preservative. Synthetic peptide within Human Bax aa 1-100 (N-terminal). 2. Air dry for 2 hours at 58° C.
3. Deparaffinize, dehydrate and rehydrate tissues. 4. Subject tissues to heat epitope retrieval using a suitable retrieval solution such as ImmunoDNA Retriever with Citrate . Place tissues/slides in a staining dish or coplin jar containing the ImmunoDNA Retriever with Citrate or EDTA, and place in the pressure cooker. Add 1-2 inches of distilled water to the pressure cooker and turn heat to high. Incubate for 15 minutes. Open and immediately transfer slides to room temperature. Retriever with Citrate or EDTA at 95°-99° C. Incubate for 30-60 minutes. Retriever with Citrate or EDTA in a Steamer, cover and steam for 30-60 minutes. 6. After heat treatment, transfer slides in ImmunoDNA Retriever with Citrate or EDTA to room temperature and let stand for 15-20 minutes. 7. For manual staining, perform antibody incubation at ambient temperature. For automated staining methods, perform antibody incubation according to instrument manufacturers instructions. 8. Wash slides with IHC wash buffer or DI water. 1. For professional users only. Ensure results are interpreted by a medical professional. 2. This product contains sodium azide (NaN3), a toxic chemical which may react with plumbing to form highly explosive build-ups of metal azides. Upon disposal, ?ush with large volumes of water to prevent sodium azide build-up. 3. Ensure proper handling procedures are used with reagent. Always wear proper laboratory equipment such as laboratory coat and gloves when handling reagents. 4. Unused solution should be disposed of according to local and federal regulations. Store at 2-8°C. Do not use after expiration date listed on package label. Temperature fluctuations should be avoided. Store appropiately when not in use, and avoid prolonged exposure to room temperature conditions. Manufactured in an ISO 13485:2016 Certified Laboratory. Small volumes of anti-Bax antibody vial(s) may occasionally become entrapped in the seal of the product vial during shipment and storage. If necessary, briefly centrifuge the vial on a tabletop centrifuge to dislodge any liquid in the container`s cap. Certain products may require to ship with dry ice and additional dry ice fee may apply. Bax is a protein of the bcl-2 gene family. It promotes apoptosis by competing with bcl-2 proper. The Bax gene contains a small promoter element that complements a binding domain on the multi-faceted p53 tumor suppressor. Wild-type p53 has been demonstrated to upregulate the transcription of a chimeric reporter plasmid, utilizing the consensus promoter sequence of Bax approx. 50-fold over mutant p53. Mutations in this consensus sequence eliminate transcription of the reporter gene. Thus, it is likely that p53 promotes Bax's apoptotic faculties in vivo as a primary transcription factor. Bax exerts a pro-apoptotic rather than an anti-apoptotic effect on cells. Bax targets mitochondrial mem-branes, inducing mitochondrial damage and cell death in a caspase-independent manner. Bad plays a critical role in the Bax-mediated apoptosis pathway by dimerizing with BclxL, causing the displacement of Bax. The displacement of Bax allows apoptosis to proceed. NCBI/Uniprot data below describe general gene information for Bax. It may not necessarily be applicable to this product. Function: Accelerates programmed cell death by binding to, and antagonizing the apoptosis repressor BCL2 or its adenovirus homolog E1B 19k protein. Under stress conditions, undergoes a conformation change that causes translocation to the mitochondrion membrane, leading to the release of cytochrome c that then triggers apoptosis. Promotes activation of CASP3, and thereby apoptosis. Tissue specificity: Expressed in a wide variety of tissues, with highest levels in the testis and ovary. Sequence similarities: Belongs to the Bcl-2 family. 1. These results indicated that the Bcl-2 and Bax played a pivotal role in the gastric mucosal I-R injury and repair by activation of ERK1/2.